This project focussed on improving a waiting area at the Cancer and Blood service at Auckland City Hospital. The role of the DHW Lab was to facilitate design workshops with clinical stakeholders and Facilities, with a view to develop refurbishment options to improve the experience for patients and families. Building on existing patient research (carried out by the DHW Lab and Performance Improvement) at the Auckland DHB, patients and families had the opportunity to vote and provide feedback on design concepts. The focus of the first workshop was to establish a shared understanding of the current waiting room experience, in order to distil a set of guiding design principles for the refurbishment. Together with the patient feedback already gathered, we compiled a set of ‘how might we’ statements. These provocations acted as a ‘design brief’ for translating users needs into concepts. Using scale models and representative furniture blocks, the second workshop began to bring form to the design principles established in first workshop. 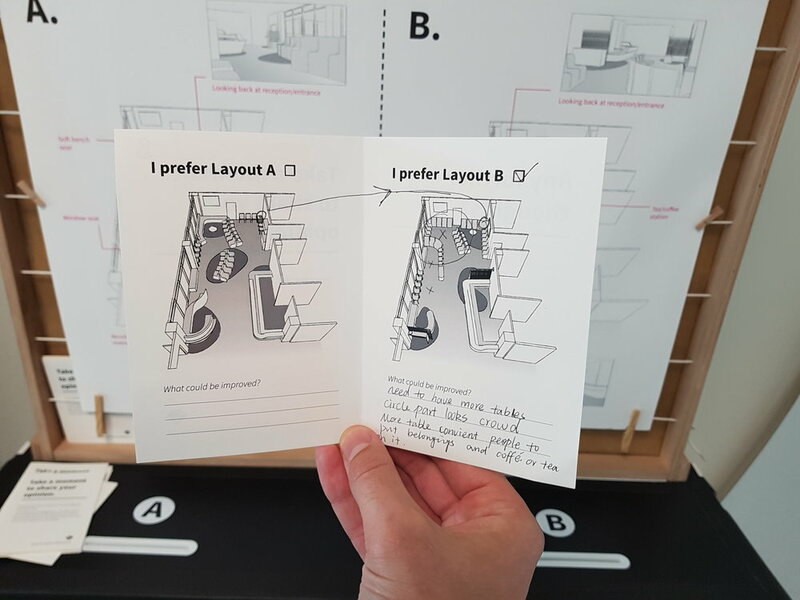 Participants experimented with furniture layouts using a scale model—discussing how different configurations would improve the room’s function and the patient experience. In a subsequent activity, the DHW Lab team sourced a range of inspiration images around the themes of: privacy, nature, furniture, and activities/interactions. We asked each other, 'which of these examples might be suitable references for this environment?' Using the models as a basis, the two groups annotated their concepts with visuals and notes. At the conclusion of the workshop, two layouts were presented to the public to provide feedback on. The final workshop moved beyond function and layout to explore how the space should look and feel, based on this session the DHW Lab put together a final set of design recommendations to be taken forward by Facilities.